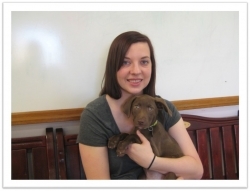 I’m Courtney Chandler, head trainer and owner of Wag and Learn. Click the links below to learn about me and my company. 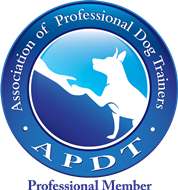 As a professional dog trainer, I feel privileged to be able to work with dogs and the people who love them on a daily basis. I wasn’t always so lucky. I started my working life as a consultant in the financial services industry. I even got my MBA from NYU. While I enjoyed the challenge and variety of consulting work, I had always dreamt of working with dogs. 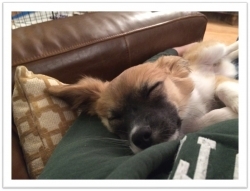 So, in February 2013, I started volunteering at Bideawee in Manhattan. Little did I know it would change my life, because that’s where I met Okie. 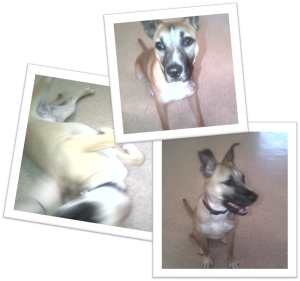 I only have a few very blurry pictures of the pup who altered my trajectory, as you can see, but his face is forever burned into my brain. Okie was an amazing dog, sweet and exuberant with me but scared of nearly everything else in the world. Having the trust and love of a dog like this is one of the greatest honors you can experience. I desperately wanted to help him, but I had no idea where to start. Inspired by Okie and dogs like him, I forged relationships with and ultimately completed apprenticeships with two exceptional dog training schools in Manhattan—School for the Dogs and Shelby Semel Dog Training. In parallel, I also worked with the staff and the head trainer at Bideawee to apply my skills and knowledge with the dogs in the shelter waiting for their forever homes. I eventually quit consulting work and now am fortunate to devote myself entirely to training and behavior work. I started this company because I want to help make the world a better place for our canine companions. In particular, I want to make a difference for the dogs who struggle to fit into the human world, and to help the frustrated, confused humans who love them. Finally, I want to help prevent behavior problems by proactively working with responsible pet parents in areas such as puppy socialization and basic manners. 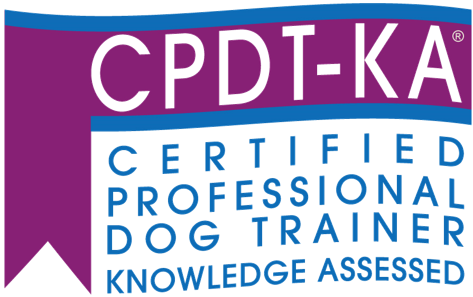 I am a Certified Professional Dog Trainer (CPDT-KA) and Professional Member of the Association of Professional Dog Trainers. From 2013 through 2015, I worked as volunteer trainer at Bideawee in Manhattan. In this capacity, I mentored other volunteers and collaborated with the head trainer to design and implement behavior modification plans for the most difficult cases in the shelter. 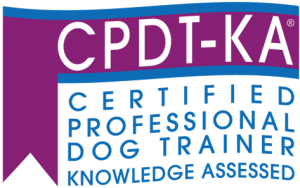 I also completed two apprenticeships with excellent training schools in Manhattan: School for the Dogs and Shelby Semel Dog Training.